SILVERHUNTER: Production of silver : a by-product. Only a small third of silver production comes from the production of silver mines, the rest comes from a small third of mine production of zinc and lead, a quarter of the copper mines and one-eighth of gold mines (the natural alloy of gold and silver is called electrum). That silver is expensive or not, it has little importance for ¾ producers silver in the world because they are producers of zinc, lead, copper and gold before being producers of silver. I am not saying that this does not concern them, but the price of zinc, lead, copper and gold that matter most to them. These metals are their primary source of income, silver is only one income. The price of silver is like the “icing on the cake”. For this reason the production of silver is unique, it depends on the fundamentals of zinc, copper, lead and gold. As production of platinum is separated from the palladium, the money is inseparable from the production of gold and industrial metals such as copper, zinc and lead. Thus the first five silver producing countries are all part of the top 5 producers of copper, zinc, lead and gold. 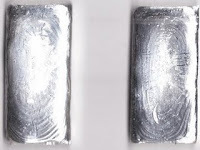 According to the USGS silver production in the world in 2008 is estimated at 20 900 tonnes of silver or 671 million ounces of silver, a new record for silver production. In 2007, production was 20 800 tonnes of silver, or 668 million ounces of silver. Silver production has benefited from record zinc prices in 2006 / 2007, of copper from 2006 to 2008, lead in August 2007, gold and silver in 2008. It is therefore not surprising that 2007 and 2008 to be record years for the production of silver. However, the end of 2008 and early 2009 have seen the price of zinc, copper, lead to collapse below their current production. At that time the bank funding disappears and capitalization mine down, and this will have consequences on the production of silver in 2009 despite the high price of gold and silver.